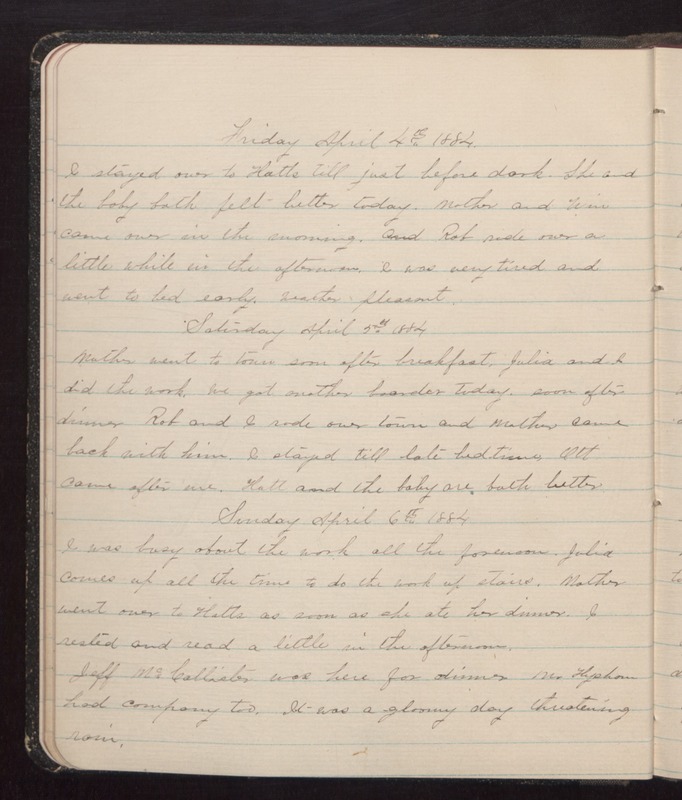 Friday April 4th 1884 I stayed over to Hatts till just before dark. She and the baby both felt better today. Mother and Jim came over in the morning. Rob rode over a little while in the afternoon and was very tired and went to bed early. Weather pleasant. Saturday April 5th 1884 Mother went to town soon after breakfast, Julia and I did the work, we got another boarder today. Soon after dinner Rob and I rode over town and Mother came back with him and stayed till late bedtime. Ott came after me. Hatt and the baby are both better. Sunday April 6th 1884 I was busy about the work all the forenoon. Julia comes up all the time to do the work up stairs. Mother went over to Hatts as soon as she ate her dinner. I rested and read a little in the afternoon. Jeff McCallister was here for dinner. Mr Hysham had company too. It was a gloomy day threatening rain.